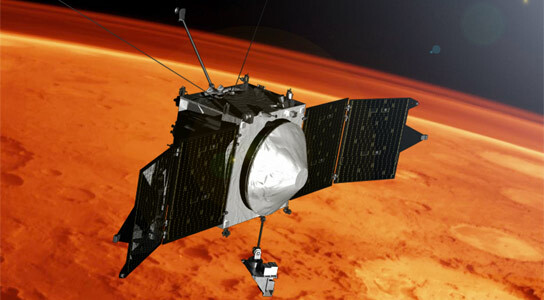 NASA’s MAVEN mission is observing the upper atmosphere of Mars to help understand climate change on the planet. MAVEN entered its science phase on November 16, 2014. New findings from NASA’s Mars Atmosphere and Volatile Evolution (MAVEN) mission reveal a new process by which the solar wind can penetrate deep into a planetary atmosphere, leading to atmospheric loss. Early discoveries by NASA’s newest Mars orbiter are starting to reveal key features about the loss of the planet’s atmosphere to space over time. The findings are among the first returns from NASA’s Mars Atmosphere and Volatile Evolution (MAVEN) mission, which entered its science phase on November 16. The observations reveal a new process by which the solar wind can penetrate deep into a planetary atmosphere. They include the first comprehensive measurements of the composition of Mars’ upper atmosphere and electrically charged ionosphere. The results also offer an unprecedented view of ions as they gain the energy that will lead to their to escape from the atmosphere. On each orbit around Mars, MAVEN dips into the ionosphere – the layer of ions and electrons extending from about 75 to 300 miles above the surface. This layer serves as a kind of shield around the planet, deflecting the solar wind, an intense stream of hot, high-energy particles from the sun. Scientists have long thought that measurements of the solar wind could be made only before these particles hit the invisible boundary of the ionosphere. MAVEN’s Solar Wind Ion Analyzer, however, has discovered a stream of solar-wind particles that are not deflected but penetrate deep into Mars’ upper atmosphere and ionosphere. Interactions in the upper atmosphere appear to transform this stream of ions into a neutral form that can penetrate to surprisingly low altitudes. Deep in the ionosphere, the stream emerges, almost Houdini-like, in ion form again. The reappearance of these ions, which retain characteristics of the pristine solar wind, provides a new way to track the properties of the solar wind and may make it easier to link drivers of atmospheric loss directly to activity in the upper atmosphere and ionosphere. 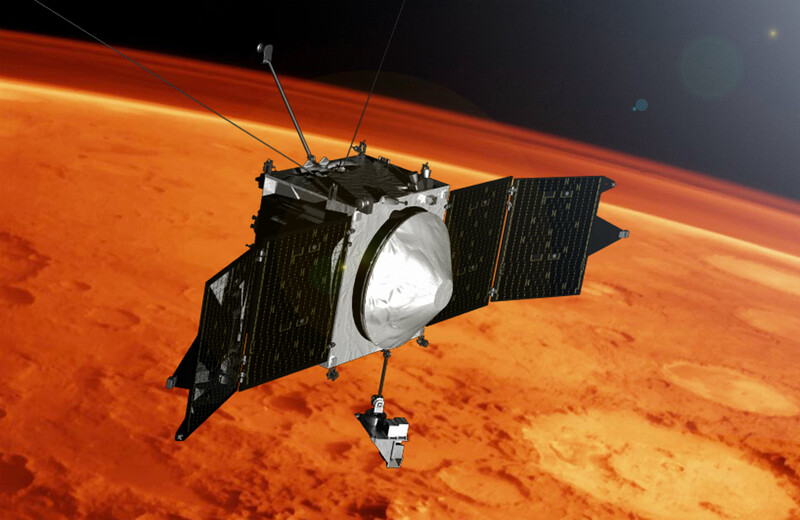 MAVEN’s Neutral Gas and Ion Mass Spectrometer is exploring the nature of the reservoir from which gases are escaping by conducting the first comprehensive analysis of the composition of the upper atmosphere and ionosphere. These studies will help researchers make connections between the lower atmosphere, which controls climate, and the upper atmosphere, where the loss is occurring. The instrument has measured the abundances of many gases in ion and neutral forms, revealing well-defined structure in the upper atmosphere and ionosphere, in contrast to the lower atmosphere, where gases are well-mixed. The variations in these abundances over time will provide new insights into the physics and chemistry of this region and have already provided evidence of significant upper-atmospheric “weather” that has not been measured in detail before. New insight into how gases leave the atmosphere is being provided by the spacecraft’s Suprathermal and Thermal Ion Composition (STATIC) instrument. Within hours after being turned on at Mars, STATIC detected the “polar plume” of ions escaping from Mars. This measurement is important in determining the rate of atmospheric loss. As the satellite dips down into the atmosphere, STATIC identifies the cold ionosphere at closest approach and subsequently measures the heating of this charged gas to escape velocities as MAVEN rises in altitude. The energized ions ultimately break free of the planet’s gravity as they move along a plume that extends behind Mars. The MAVEN spacecraft and its instruments have the full technical capability proposed in 2007 and are on track to carry out the primary science mission. The MAVEN team delivered the spacecraft to Mars on schedule, launching on the very day in 2013 projected by the team 5 years earlier. MAVEN was also delivered well under the confirmed budget established by NASA in 2010. The team’s success can be attributed to a focused science mission that matched the available funding and diligent management of resources. There were also minimal changes in requirements on the hardware or science capabilities that could have driven costs. It also reflects good coordination between the principal investigator; the project management at NASA’s Goddard Space Flight Center; the Mars Program Office at NASA’s Jet Propulsion Laboratory in Pasadena, California; and the Mars Exploration Program at NASA Headquarters. The entire project team contributed to MAVEN’s success to date, including the management team, the spacecraft and science-instrument institutions, and the launch-services provider. MAVEN’s principal investigator is based at the University of Colorado’s Laboratory for Atmospheric and Space Physics in Boulder, and NASA’s Goddard Space Flight Center in Greenbelt, Maryland, manages the mission. Be the first to comment on "MAVEN Identifies Links to Atmospheric Loss on Mars"